The summer before Kindergarten my oldest and then five year old promptly crossed her arms over her little chest, let out a big huff, and declared that she didn’t want to learn to read. The experienced mom in me took a breath and knew she didn’t really mean it, but the book lover in me was already crying inside. In fact, I did cry later that night when telling my husband about it. My mind was torn between that little grief and thinking about all the ways to get your child to love reading. My husband was less emotional about it. Don’t force it. She’ll come around. Honestly, as succinct as that is, it’s probably a little more eloquent than he put it at the time, but what matters is he was right. (Don’t tell him I admitted that.) You can’t force your child to love reading, and of all the ways to get your child to love reading, force is the one sure to result in the exact opposite effect. So, I took my husband’s advice and focused on the ways I could motivate her to read instead. Psst… keep reading for a fun and free printable to go along with your child’s next book! It sounds overly simply, right? Maybe, but reading to your child is probably one of the most effective ways to encourage a love of reading. While my kids will insist on reading the same favorites over and over again—we tend to read pretty regularly mid-morning, after school, and before bed—I notice that after a while their interest wanes. Even if they are completely insistent that is the story they want to read, their attention may only last half the book. One way to keep reading exciting for your kids (and let’s face it, you) is to subscribe to a monthly book club. Kid Curated Books offers a completely custom subscription box for kids, and each month they send a new collection of books. Each box is tailored to your child specifically, so you’ll always have something new and interesting to dive into. 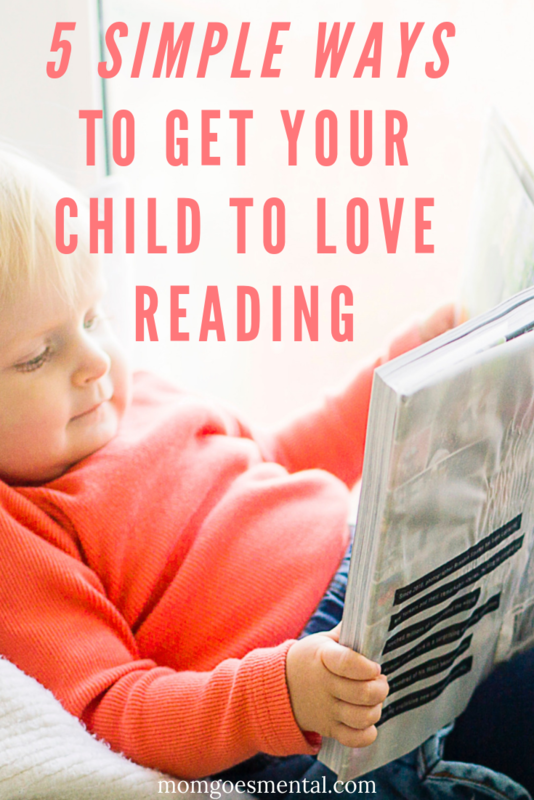 When I advocate for reading to your child as one of the best ways to get your child to love reading, I don’t mean trudging through a book at bedtime because you have to. I mean, make the story come alive! Let loose and try out silly voices for each of the characters. Make wild faces and sound effects. Then ask your child questions and engage them along the way. Uh, oh, the dragon woke up. What’s going to happen to the clumsy prince? When you subscribe to receive a Kid Curated Books box, you receive a diverse range of books each month, so you’ll have plenty of time to try out your new cast of voices. Bonus—they even have special holiday and birthday boxes! Whether you want to create a special reading time in the hours before bed or as a segue into a good morning nap, a reading time ritual can be another of the ways to get your child to love reading. For my youngest daughter, at just over one year old we read during morning playtime and as part of her bedtime routine, so new books from Kid Curated Books would be worked naturally into that ritual. With my school-aged kids, we typically read in the afternoons together, and they read alone in the evening to go to sleep. For them, a monthly subscription box like Kid Curated Books would become part of their afternoon activities. However, Kid Curated Books also offers a Monthly Book Club for kids 8-12 where one of your child’s monthly books is the Book Club’s book. Then they do a live review on their Facebook and encourage a book discussion in the comments! Are you subscribing to Kid Curated Books for your child? While you wait for your first box to arrive, hang out with Kid Curated Books on Facebook, stop by their Instagram, or say hello with a tweet on Twitter. I’m happy to say that my oldest daughter did learn to read and eventually love it, and a lot of that comes from how we handled her absolute refusal to want to read. However, parenting is full of perfect hindsight. Looking back, I think she would’ve enjoyed reading even earlier if we had focused more on her interests. As a lover of fantasy, that’s mostly what I have in my house. Whimsical baby books aged into stories about lost dragons and became chapter books about fairies. No doubt my daughter does like them, but they never sparked a passion in her like they do in me. This girl loves horror. Kid Curated Books helps you do exactly what I wish I’d done more: hone in on your child’s interests. When signing up, you’ll take a quiz that helps narrow down just what books your child would be interested in, as well as their reading level. Then your child’s monthly box includes books that match those results! Deal Alert! Use code FREESHIP at checkout before December 31 to get free shipping on your first box (valid in the USA). Subscribe Now! To make your reading time even more engaging and fun, try using this whimsical book review worksheet next time! My kids really hate their school reading logs—they don’t like feeling forced to read. So I created a fun Book Review worksheet just for them. When we do the worksheet together, they feel like the big shot book critics they see snippets of on their book jackets. My youngest likes to use her book review worksheet to play teacher later. On the other hand, my oldest likes the ability to detail out how she correctly interpreted the book. It’s fascinating to see how their personalities affect their perception, and they really do have a blast with it! Love that there is a curated box of books for kids! I did not know that! I also heard the recommendation to create a book nook in your house with a reading area and shelf with books to encourage reading. Such lovely ideas. Personally, I loved reading as a kid and still consider it one of my favorite treats. Today there are so many other distractions for kids – it’s great you offer some tips how to get them back to reading actual books. Such great tips! I just loved being read to as a kid! We read to our daughter since the day she was born! Now she loves books! I don’t have kids yet, but getting them to read is definitely so important. I love your ideas and the printables are a fabulous idea! These are such great tips! As a child, I loved it when my dad would read to me, that’s probably why I enjoyed reading so much as a little girl. Love this post. That’s such a sweet memory! I lost my dad a few years ago, and those are the kinds of memories that can make me smile.